Treat yourself or your friends and family to a world of limitless possibilities. With an unparalleled assortment of the leading international and national brands in clothing for men, women, and kids; accessories, fragrances, cosmetics, footwear, home furnishing and decor products, Shopper Stop's 106 stores across 37 cities in India aim to provide shoppers a truly international shopping destination. 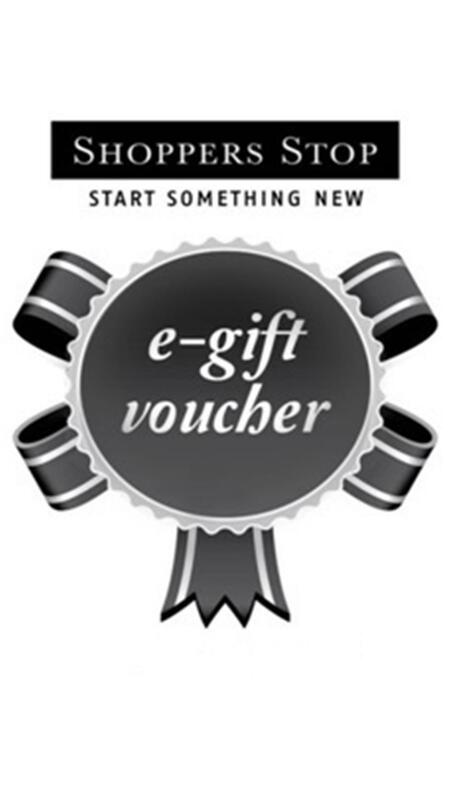 eGift voucher is valid for a period of 1 year from its date of issue. eGift voucher is not valid for purchase of mobiles, mobile phone accessories, cameras, MP3 players, laptops, 22K & 24K gold jewelry & gold coins. eGift voucher cannot be redeemed or exchanged for cash or credit nor can be exchanged for a Gift Voucher/Gift Card. eGift voucher cannot be exchanged for smaller eGift voucher denominations. Once used, eGift voucher cannot be reloaded. eGift voucher can be partly redeemed only on the Shoppers Stop website & the balance will continue to remain against the eGift voucher number. E-GV can be partly utilized @ Shoppers Stop Stores and the balance will be issue to the customers as a CN (Credit note). If the eGift voucher is lost, misplaced or stolen, neither will a new eGift voucher be issued nor will the money be refunded in any manner. Duplicate eGift voucher will not be issued. If the invoice value is greater than the eGift voucher value, customer can pay the balance amount through Cash, Debit Card, Credit Card as the case may be. Shoppers Stop Limited shall not be liable and responsible for any unauthorized and/or fraudulent purchase/s made using this eGift voucher. The holder of the eGift voucher shall be solely responsible for the safe custody of the eGift voucher and the credentials mentioned on it. For balance enquiry & expiry, contact a cashier or SMS GCBAL16 digit E-GV number to 56161 or log on to shoppersstop.com. eGift Card cannot be cancelled once order is placed.